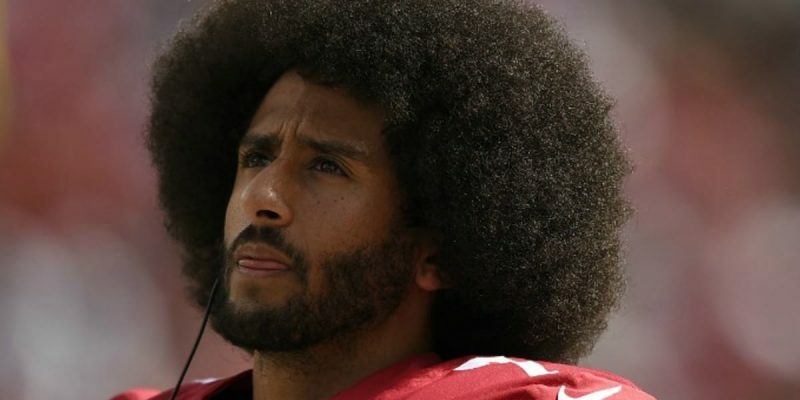 If you are like me you thought to yourself when you first heard of NFL quarterback Colin Kaepernick refusing to stand for the National Anthem, what an idiot! Here’s a guy living in a country where he can make millions throwing a football. A guy living a country where blacks are treated better and have more opportunity than any other nation on the planet. A guy so clueless about how fortunate, blessed, and lucky he is to be born in the least racist nation in history. How could Kaepernick be such a fool? Then he opened his mouth and everything made sense. Poor young Colin had been duped, indoctrinated, and lied to by cultural Marxists. Wearing a Fidel Castro t-shirt, Kaepernick preached to his fellow Americans about human rights. What’s his next move? Wearing a Michael Moore t-shirt while lecturing us about eating healthy. Before you get angry with the six-foot-four, 230-pound, college educated with a 4.0 GPA Kaepernick or his fellow NFL kneelers, keep in mind they have been brainwashed and are totally unaware of their condition. So many Americans, especially those under 30, have been told over and over America is racist. Cops are racists. Corporations are racists. Everyone over 30 is racist unless they are a minority then you can’t be a racist. All conservatives and Trump supporters are racists. So are all white people. In fact if you happen to run across a non-racist in America, take a picture, the rarity may be a collectors item one day. It’s like a cult this racist here, racist there, racist everywhere mentality. Why would we expect anything less after cultural Marxists and leftist social engineers for almost an entire generation now have taken over our schools and started filling our kid’s heads with mush like multiculturalism. What we are experiencing today is the equivalent of a zombie apocalypse only instead of zombies we are witnessing a bunch of brain-dead, group-think, brainwashed leftists roaming the land as intellectual zombies. Why would we be surprised these zombies found their way to the sidelines of the NFL? The walking intellectual dead will face some resistance this week at the Cleveland Browns game after the city’s police union has decided they won’t hold the American flag in the pregame ceremony. They are holding a protest of the protest. Good for them. You’ll remember several Browns players kneeled during the anthem before one of their NFL preseason games this year. Cleveland Police Patrolmen’s Association President Steve Loomis said that didn’t sit well with him or other members. What angered Loomis even more was the Browns front office and owner allowed it to happen. No doubt NFL players have free speech rights and the right to protest on their own time. But NFL owners have every right to demand their players/employees keep their anti-America, anti-cop protests to themselves while they are in uniform, on the job, and earning millions. Bunch of ingrates! NFL ratings are down since Kaepernick pulled his – look at me I am socially aware and super enlightened – publicity stunt. And that’s a good thing. Americans are savvy enough to know a group of people getting paid millions to play a game should be the last ones on earth complaining about anything. I don’t know about you but I am getting awfully close to giving up on a league I have followed closely and enjoyed watching my whole life. My father and I were at Tulane Stadium when Tom Dempsey kicked his record shattering, game-winning 63-yard field goal. I was ten and remember it well. My teenage years in the late 70’s I suffered through watching the “Aints” but never lost hope. I flew 4382-miles to New Orleans so I could be with my family and watch the Saints play in the Superbowl. The team has been a big part of my life my entire life. But I will say this. If I see one New Orleans Saint player disrespect our nation and police by refusing to stand for the National Anthem and that player is not disciplined for it by team ownership, than I am done with the Saints. I won’t support an organization that condones disrespecting our nation and her heroes. Dallas Cowboy owner Jerry Jones has said very plainly and clearly he will NOT allow any of his players to protest the National Anthem. He took a courageous stand. Other NFL owners, Tom Benson, what say you? My fellow NFL fans, what say you? Next Article CARLETON: A Possible End To The Federal Government’s Regulatory Red Snapper Debacle?